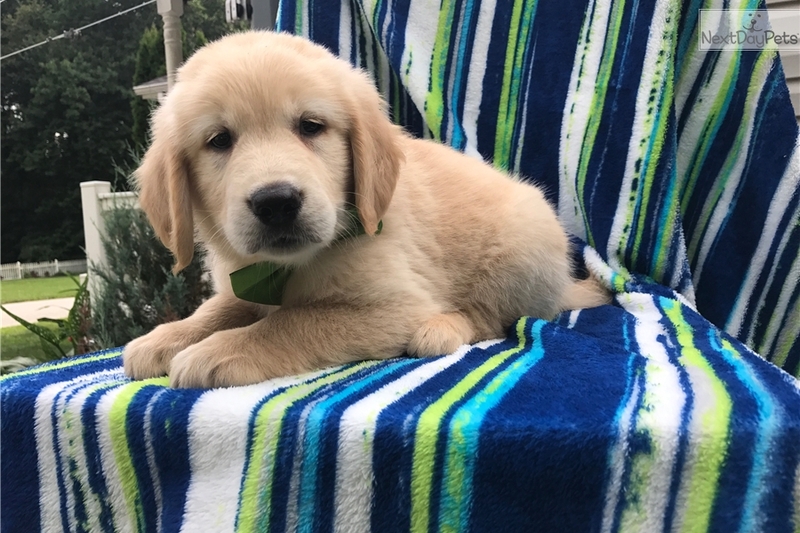 This Golden Retriever nicknamed Kody sold and went to a new family. Hi my name is Kody. I'm super friendly and I love kids. I was born on June 5. I'm a Golden Retriever honestly how can you not take me home. As an added bonus I'm outgoing, kind and gentle, you're going to love me. I'm vet checked, dewormed, and I'm even up to date with my current vaccinations. Oh, as an added bonus I'm AKC registered. I can't wait for you to take me home. If you want to have one of us flown out to you, delivered by car or come and meet them in person feel free to call/text Shana at 609-626-4595 or email her at if you're interested. We have scheduled appointments available Monday - Saturday from 9 am to 9 pm. I hope to see you soon! Oh also, the health guarantee is for thirty days, but you only need a minute to fall in love.